On April 22, 1994, Richard Milhous Nixon, the 37th President of the United States, died after suffering a stroke four days earlier, at the age of 81. His public funeral followed five days later at the Richard Nixon Presidential Library and Museum in his hometown of Yorba Linda, California. In keeping with his personal wishes, Nixon's funeral was not a full state funeral, though his body did lie in repose in the Nixon Library lobby prior to the funeral services. Nixon suffered a cerebral vascular accident (a stroke) on April 18 at his home in Park Ridge, New Jersey, and was taken to New York Hospital–Cornell Medical Center. After an initial favorable prognosis, Nixon slipped into a deep coma and died four days later. His body was flown to Marine Corps Air Station El Toro, Orange County, California, via SAM 26000, the presidential plane used as Air Force One while Nixon was in office. His body was transported to the Nixon Library and laid in repose. A public memorial service was held that evening, attended by world dignitaries and all five living presidents. 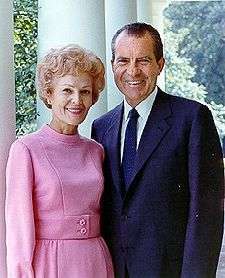 Nixon's wife, Pat, had died ten months earlier on June 22, 1993. This was the first funeral for a U.S. president since Lyndon B. Johnson in 1973. Nixon presided over President Johnson's funeral, as Nixon was the U.S. president at that time. Nixon suffered a massive stroke (cerebral vascular accident) at his Park Ridge, New Jersey, home while preparing to eat dinner on Monday, April 18, 1994 at 5:45 PM EDT. An ambulance was called and he was taken to New York Hospital–Cornell Medical Center. He was conscious but unable to speak, and his vision was impaired. It was determined that a blood clot resulting from his heart condition had formed in his left atrium (upper heart), then broke off and traveled to his brain. His condition was determined to be stable the following day, as he was alert but unable to speak or move his right arm and leg. Nixon's prognosis was hopeful, and he was moved from the intensive care unit into a private room. His condition worsened that Tuesday night, however, complicated by symptoms of cerebral edema, or swelling of the brain. Nixon's living will stipulated that he was not to be placed on a ventilator to sustain his life. On Thursday, Nixon sank into a coma. That Friday night, he died at 9:08 PM, April 22, 1994. His daughters, Tricia and Julie, were by his side. U.S. President Bill Clinton announced Nixon's death in the White House Rose Garden and proclaimed a national day of mourning five days later. Clinton stated that Nixon was "a statesman who sought to build a lasting structure of peace" and praised his "desire to give something back to this world." Clinton said that he was "deeply grateful to President Nixon for his wise counsel." Tributes also came from former Presidents Gerald Ford, Jimmy Carter, Ronald Reagan and George H. W. Bush. Former Secretary of State Henry Kissinger, former Senator George McGovern (who ran against Nixon in 1972), former Senator Howard Baker, Senator Robert Dole, Senator John McCain and Senator Edward M. Kennedy also reflected on Nixon's death. Following the news of Nixon's death, tributes were placed at the Richard Nixon Presidential Library in Yorba Linda, California, the site of his birthplace. On April 26, the casket was placed into VC-137C SAM 26000, a member of the presidential fleet used as Air Force One while Nixon was in office, and flown to Marine Corps Air Station El Toro, Orange County, California. The body was transported in a motorcade, by hearse, to the Nixon Library. Nixon's funeral on April 27, 1994 was attended by President Bill Clinton and First Lady Hillary Clinton, accompanied by former U.S. presidents (right-left) Gerald Ford, Jimmy Carter, Ronald Reagan and George H.W. Bush, with Betty Ford, Rosalynn Carter, Nancy Reagan and Barbara Bush respectively. Carried by eight military pallbearers representing all branches of the United States military, Nixon's body was placed in the library lobby and lay in repose from the afternoon of Tuesday, April 26 to the afternoon of Wednesday, April 27. Despite severe rain, police estimated that roughly 50,000 people waited in lines up to 18 hours to walk past the casket and pay their respects. The funeral service was held on Wednesday, April 27, on the grounds of the Nixon Library. The service was attended to by over 4,000 people, including family members, President Bill and Mrs. Clinton, President George H.W. and Mrs. Bush, President Ronald and Mrs. Reagan, President Jimmy and Mrs. Carter, and President Gerald and Mrs. Ford. Former Vice President Spiro Agnew also attended. A Congressional delegation consisting of over one hundred members was present, and a foreign diplomatic corps of over two hundred. The service was officiated by the Reverend Dr. Billy Graham, a friend of Richard Nixon's, who called him "one of the most misunderstood men, and I think he was one of the greatest men of the century." Eulogies were delivered by Graham, Henry Kissinger, Senator Bob Dole, Pete Wilson, Governor of California, and President Clinton. Dole could not hold back his tears at the end of his speech, a rare show of emotion in public for the Senator. Following the service, Nixon was laid to rest beside his wife, Pat, who had died on June 22, 1993, making Nixon the most recent President to be widowed. They are buried only steps away from Richard Nixon's birthplace and boyhood home. The funeral was the last major public appearance of President Ronald Reagan, whose affliction with Alzheimer's disease was announced later that year. Reagan would die 10 years later, on June 5, 2004. ↑ "Reagan funeral: Schedule of events". BBC. June 11, 2004. Retrieved 2008-07-18. 1 2 Perez-Pena, Richard (April 19, 1994). "Nixon 'Stable' After Stroke At His Home". The New York Times. Retrieved 2008-08-14. 1 2 3 4 5 6 7 8 "Funeral Services of President Nixon". Richard Nixon Library and Birthplace Foundation. Retrieved 2008-08-14. 1 2 3 4 5 6 7 8 9 10 11 Weil, Martin and Eleanor Randolph (April 23, 1994). "Richard M. Nixon, 37th President, Dies". The Washington Post. p. A01. Retrieved 2008-08-14. Black, Conrad (2007). Richard M. Nixon: A Life in Full. New York: Public Affairs. ISBN 978-1-58648-674-7. Wikimedia Commons has media related to Death and funeral of Richard Nixon.